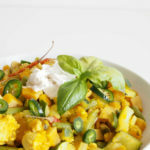 Butternut pumpkin chili - paleo & vegan - NOURISH TO PERFORM. After sharing my summer smoothie bowl, I finally comitted myself to cooking more autumn dishes. Recently, I am addicted to pumpkin. I love going to the farmer’s market every week to see what sort they have. At the moment, butternut pumpkin seems to be in season. Actually, this is my favorite one – I prefer its taste over the one of hokkaido pumkin. Craving a heart-warming bowl on a rainy Saturday, I made this butternut pumkin chili. It is beanless, paleo, glutenfree and depending on your choice of protein it is vegetarian or vegan. 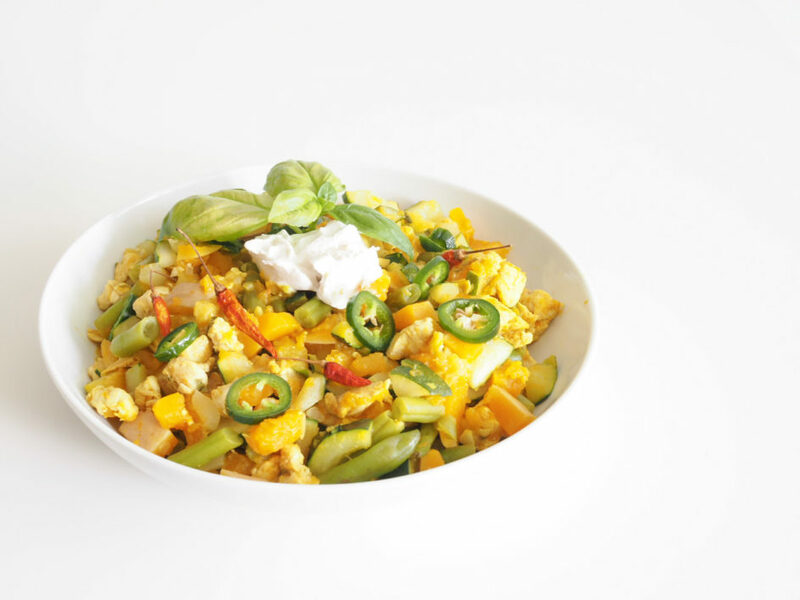 The butternut pumpkin’s sweetness gets even more intense when adding cumin to this dish while chili and ginger boost your immune system and help you to stay healthy during colder days! I discovered that adding thick and creamy homemade cashewmilk to such pot dishes makes them even more delicious. Of course, you can just make this chili with veggies and have it as a side dish to whatever you like. Sometimes I just toast some paleo nut bread and eat this dish without chicken and have a lot of almond fresh cheese instead. Another great way is to have this as a warming starter. Whether you are looking for a soulfood dish on a cozy evening or for a warming meal after being outside in the cold – definitely give this dish a shot! Cut up the veggies and steam them./Das Gemüse würfeln und bissfest garen. Heat up a pan with coconut oil, cumin and chili and fry chicken (or whatever you use). Add cooked veggies and salt and pepper and then add cashew milk and let simmer with the lid on for some minutes./Eine Pfanne mit Kokosöl, Kreuzkümmel und Chili erhitzen und Hühnerstücke (oder andere Proteinquelle wie Hack oder Tofu) darin anbraten. Das gekochte Gemüse, Salz und Pfeffer dazugeben und dann mit Cashewmilch ablöschen. Kurz mit Deckel köcheln lassen. Serve with fresh herbs, e.g. basil and some almond fresh cheese if you like./Mit frischen Kräutern, ich liebe Basilikum dazu, servieren und eventuell noch Mandelfrischkäse darauf geben. Didn’t have cashewmilk and used instead some coconut cream (can really recommend this!) and hokkaido pumpkin. But still a nice, fresh and light dinner.